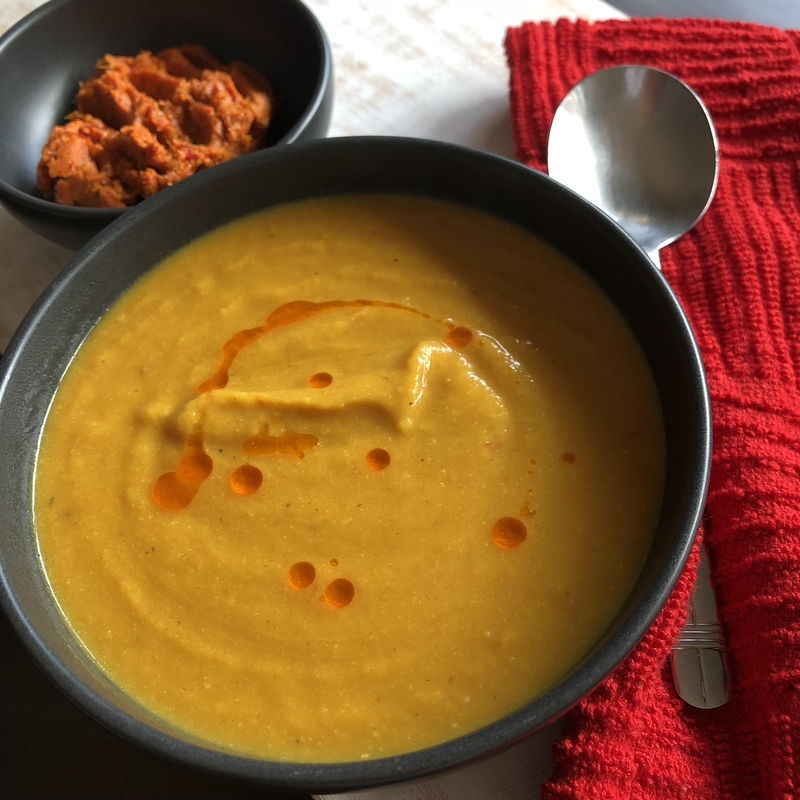 There’s nothing better then on a Winter’s day, when you are cold right through to the bone, to warm yourself up with a hearty, nourishing soup. The sweetness of the roasted vegetables balances out so nicely with the spice of the red curry paste. This is sure to be a soup that pleases everyone! Preheat oven to 200 degrees and line a tray with baking paper. Place the chopped cauliflower and pumpkin on the tray and drizzle with 1 teaspoon of olive oil. Season with salt and roast in the oven for 30-40 minutes, until the cauliflower and pumpkin have softened and begin to brown. In the meantime, start preparing your soup by heating the remaining olive oil on medium heat. Add your onions and sauté for 5 minutes. Add your carrots and cook for a further 10 minutes until they begin to soften. Add your garlic and ginger and stir to ensure they don't burn for a further minute. Add your turmeric and red curry paste. Maybe start with 1-2 tablespoons and you can always add more if you prefer it spicier. Stir for 1 minute and then deglaze the pan by adding some vegetable stock. Scrape the bottom of the pan to remove all the dark bits. Add your roasted vegetables and the remaining stock. Bring to a simmer and cook for a further 10-15 minutes. Remove the pot from the stove and blend the soup until smooth by either using an immersion blender or transferring the soup to a blender in batches. Add your coconut milk to the soup and adjust your seasonings as required. I love taking simple ingredients and creating something special. This garlic roasted pumpkin will absolutely melt in your mouth!! With the addition of the walnut pesto and toasted almonds, it takes the flavours to the next level. The left over pesto can be stored in a glass jar in the fridge for 4-5 days or can be frozen for 3 months. It can be used as your sauce to pasta, a dip or a delicious spread in your sandwich. Preheat oven to 180 degrees Celsius. Prepare a tray with baking paper and prepare your pumpkin by cutting it in half length-ways and removing all the seeds. Place the pumpkin on the tray skin side down. Rub the pumpkin with the garlic, season and drizzle with the oil. Bake in the oven for 75 minutes. The pumpkin should be very soft. 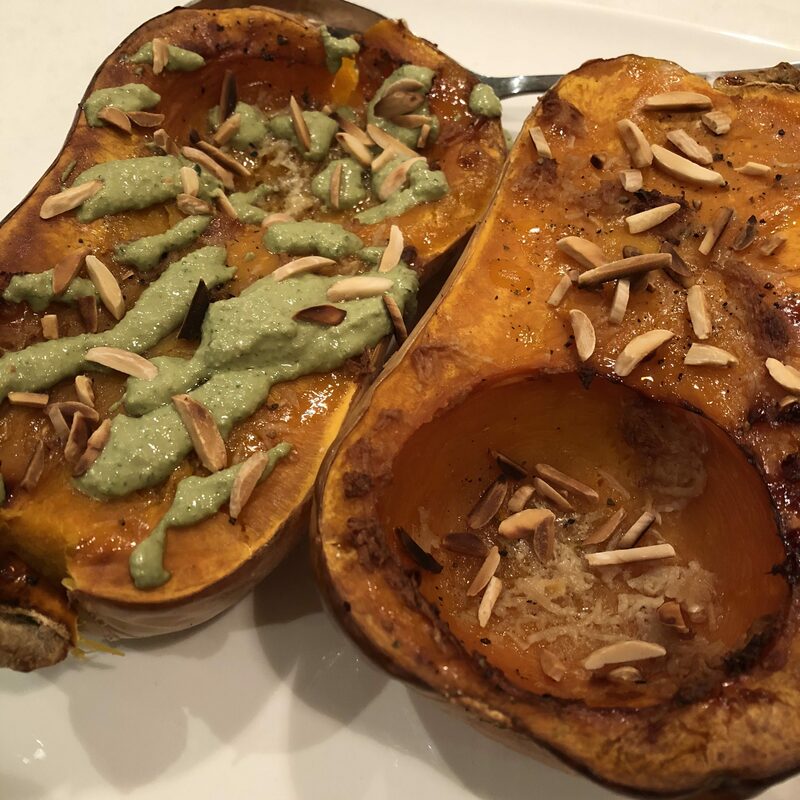 Transfer the pumpkin to a tray and top with the walnut pesto and slivered almonds. Every year at Passover I make a batch of macaroons - the kids love them. They are quick and easy to make and the flavour can be adjusted to your liking. They aren't too sweet, but are soft and chewy, just as macaroons should be. ​Mix your cacao, coconut oil, syrup and salt in a large bowl placed on top of a pot of simmering water. Stir until it is all melted and mixed together. Mix in your shredded coconut. 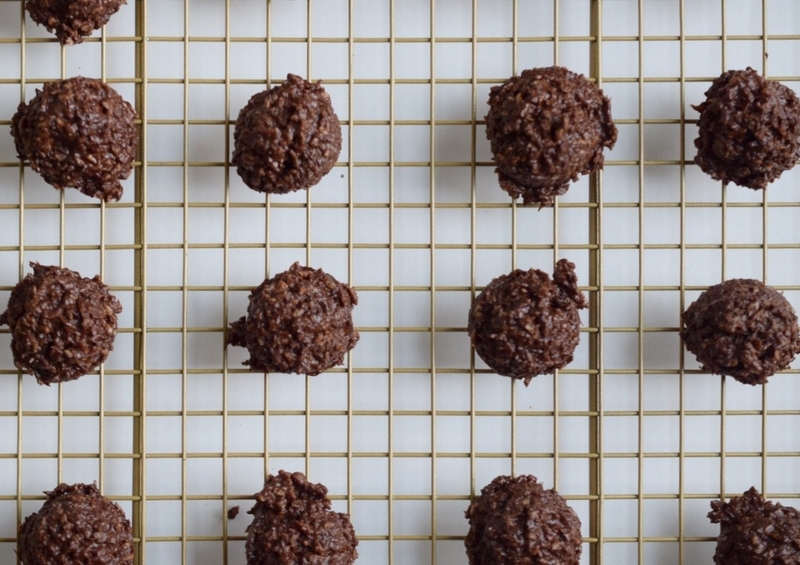 Line a tray with non-stick paper and use a tablespoon to shape them into macaroons. Note / you can add some peppermint or orange essential oil to adjust the flavour. 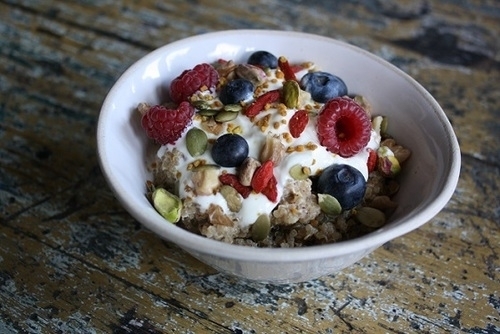 Quinoa Porridge is a fabulous, protein rich alternative to an oat based porridge. It's a gluten and grain-free breakfast that is super delicious and nutritious. It’s a great way to use up left over quinoa so next time you are planning a quinoa based meal, make sure you cook a bit extra for breakfast the next day. add 4 tablespoons of mixed raw or gently roasted nuts and seeds. In a pot, mix the quinoa, milk, sweetener and optional extras and heat until it is just hot (but not boiling). Top with some additional nuts and seeds / chia seeds / coconut / cacao nibs and fresh fruit such as banana or berries. 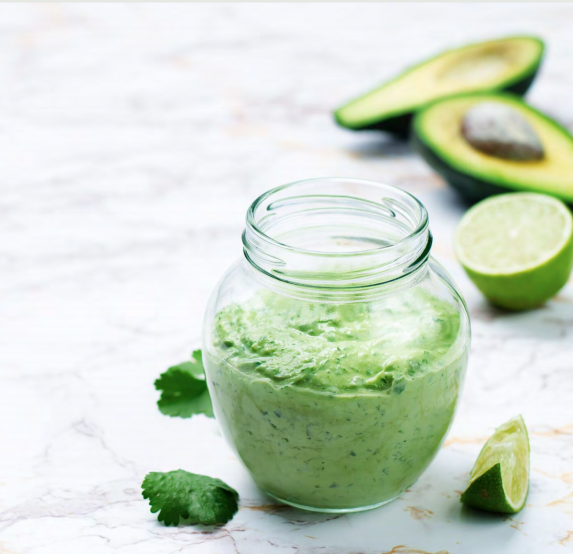 We all know that avocado makes an amazing addition to a salad so why not take it that extra step and turn it into a delicious, creamy dressing to make your salads completely irresistible! Put all the ingredients in a processor and whiz until smooth and creamy. Taste and adjust flavours to your liking. Serve over your favourite salad, as the mayonnaise in coleslaw, with grilled fish or as a dip. Add fresh or sundried tomato and some dried Italian herbs for a creamy Italian dressing. You could sweeten with a little stevia if you prefer a sweeter dressing. There is absolutely no need to miss out on the finer things in life! 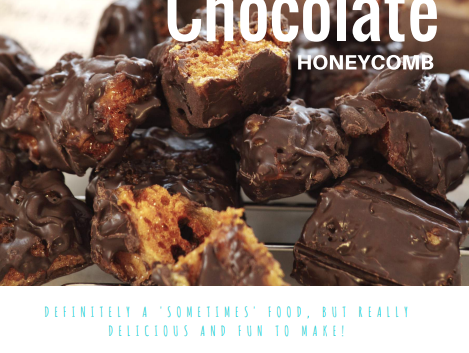 Violet crumbles used to be an absolute childhood favourite of mine so this is super exciting to be able to enjoy the deliciousness of the honeycomb and chocolate with every crunch and feel completely guilt-free about it. This recipe is super clean and will nourish you with every mouthful! Line a 20 cm baking tin with non stick paper. Combine the honey and coconut sugar in a saucepan and stir over a low heat until the sugar dissolves completely. Bring the mixture to the boil, and allow the mixture to gently boil for two minutes without stirring. Remove from the heat and stir in the bicarb, taking care for the mix not to spill over. Pour into the tin and set aside. Once the mix has cooled, place into the fridge overnight. Line a new container with non stick paper. Roughly chop the honeycomb and place into a bowl. Drizzle over the melted chocolate and stir to combine. Press the mixture into your prepared tin and place in the fridge to set. Slice to desired bars. Sometimes it's nice on the weekend to spend a little extra time and create something special for breakfast. 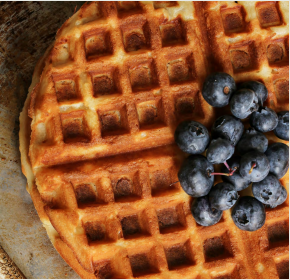 Here's a recipe for a healthy, delicious and nutritious waffle that your family will absolutely love! I know mine does! Blend all ingredients together excluding the flour until really smooth, then add the flour and pulse to combine. Preheat your waffle iron on the lowest setting. Lightly grease with coconut oil if needed, then add 1/2 cup to the centre and close the lid. If your mixture becomes stiff whilst cooking the waffles, add a little extra milk (the flour continues to absorb the liquid as its sitting there). Cook for a few minutes on each side, careful not to burn it. Serve with a drizzle of honey or maple syrup and some fresh fruit. Making sandwiches for the kids everyday can become boring, so I like to change it up a little. 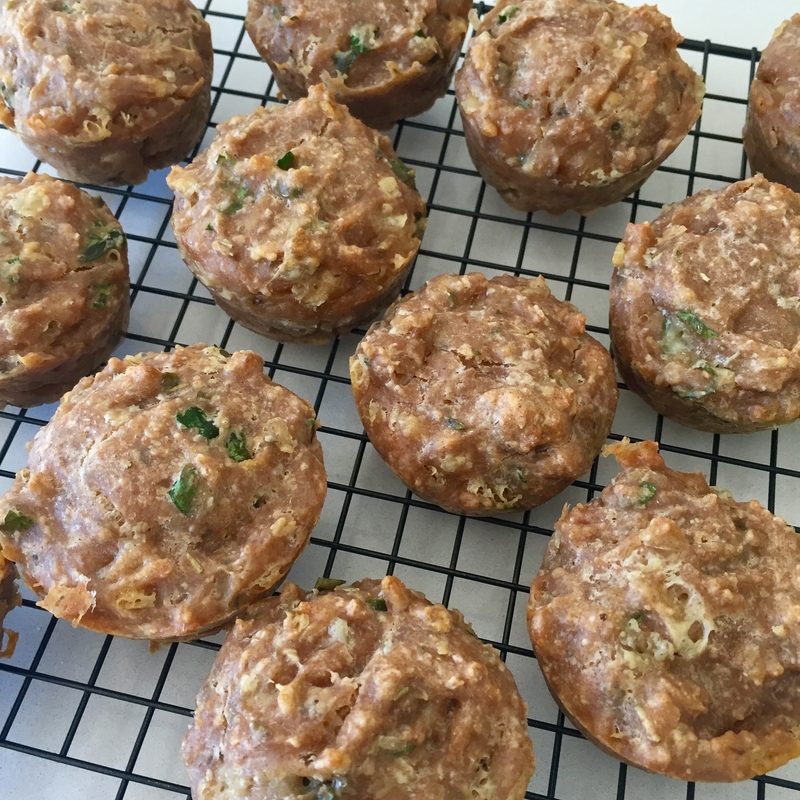 These savoury cheese and herb muffins are the perfect swap and are great as snacks too. Packed with a lot of flavour and goodness, you're kids will absolutely love them. They also freeze really well so it's always handy to have an extra batch prepared and ready to go. Preheat your oven to 180 degrees. Grease your muffin tins and set aside. Place the flour in a large bowl and using your hands rub in the butter. Add your dry herbs and cheese and mix. Add your eggs and milk and mix so that it is all well combined. Be careful not to over mix. Spoon the mixture into your muffin tin and bake for 20 minutes. 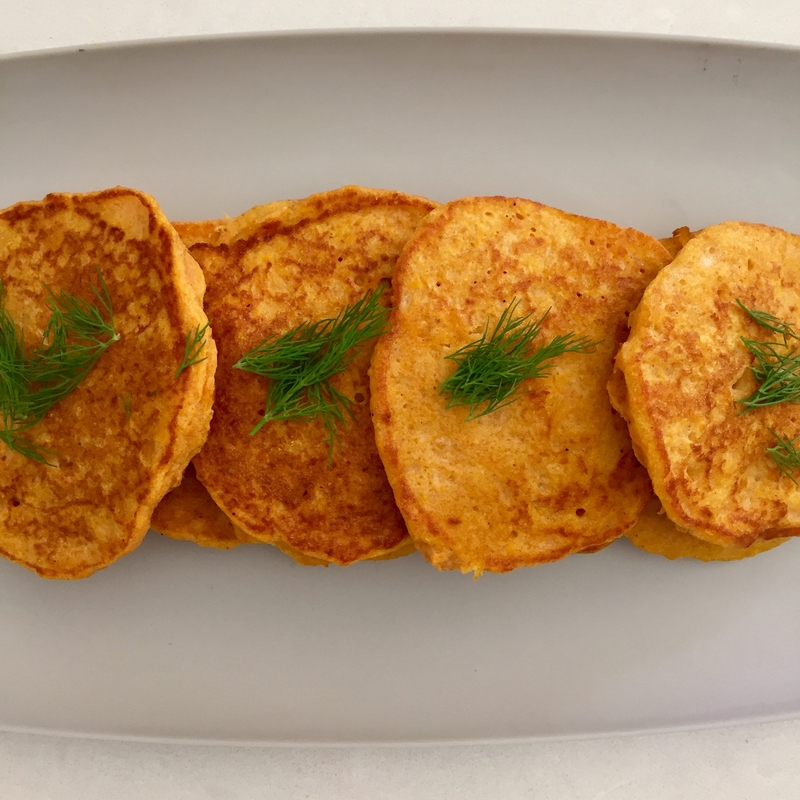 Moving away from the traditional potato fritters, here is a lower-GI version using pumpkin. These are so light and fluffy that you'll almost mistake them for your breakfast pancakes! Steam your pumpkin until it is soft enough to mash. Pat the pumpkin dry once it is finished steaming and then transfer into a bowl to mash. Add your eggs, baking powder, flour, salt and pepper and mix so that it is well combined. Heat 1 tablespoon of the oil in a pan on medium heat and then add 1.5-2 tablespoons of the mixture for each fritter. Allow it to cook for 3-4 minutes until golden brown and then carefully turn them over and cook for a further 3 minutes. Once cooked, remove the fritters onto a plate with paper towel to allow some of the oil to be soaked and then serve.